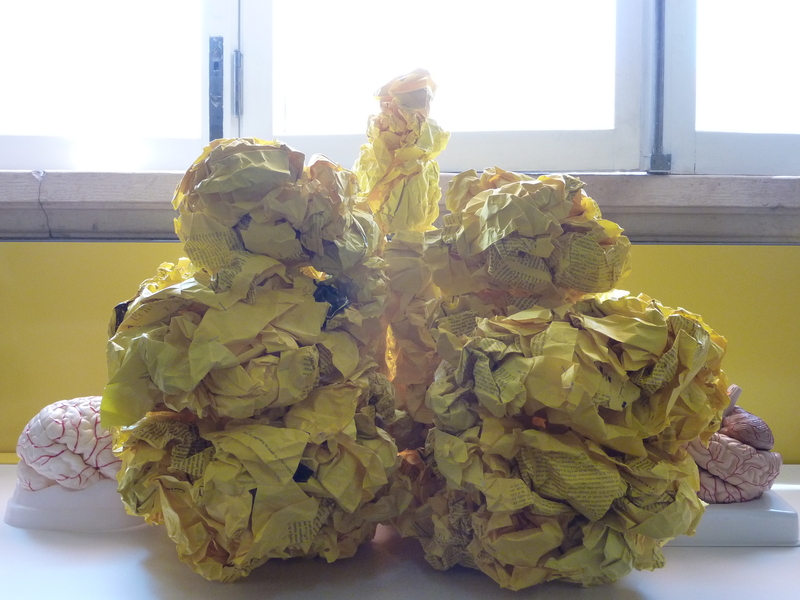 For about a month now, we’ve been reusing the rumpled yellow papers that were left from The Review Game. We thought: here we have a bunch of papers with scientific information about neuroscience which have a history; they’ve been read, rumpled, cited, paddled over a table by researchers, they were fun to use and interesting to comment on. We felt they had the potential to build something. And so we started to build a brain out of them. 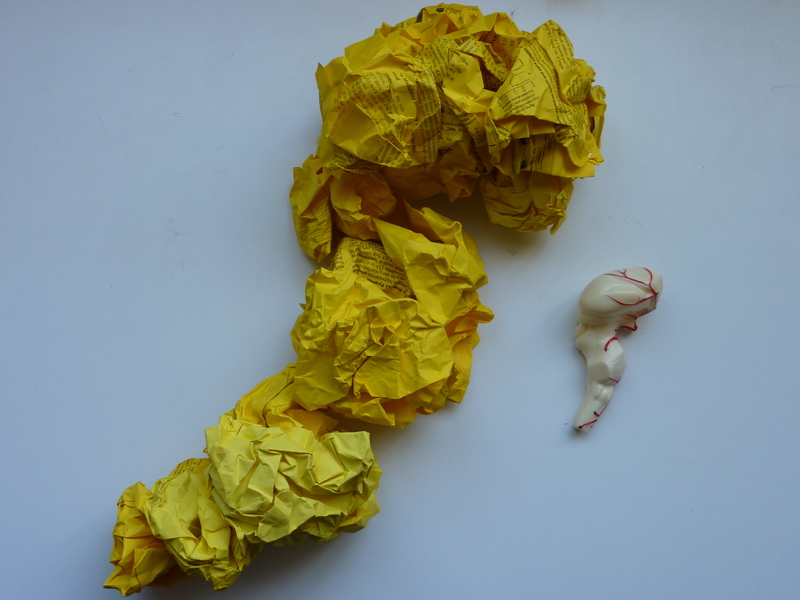 We began to bind one paper to the other and the other and the other, and the different parts of a human brain started to grow. We used some models to get the hang of it. 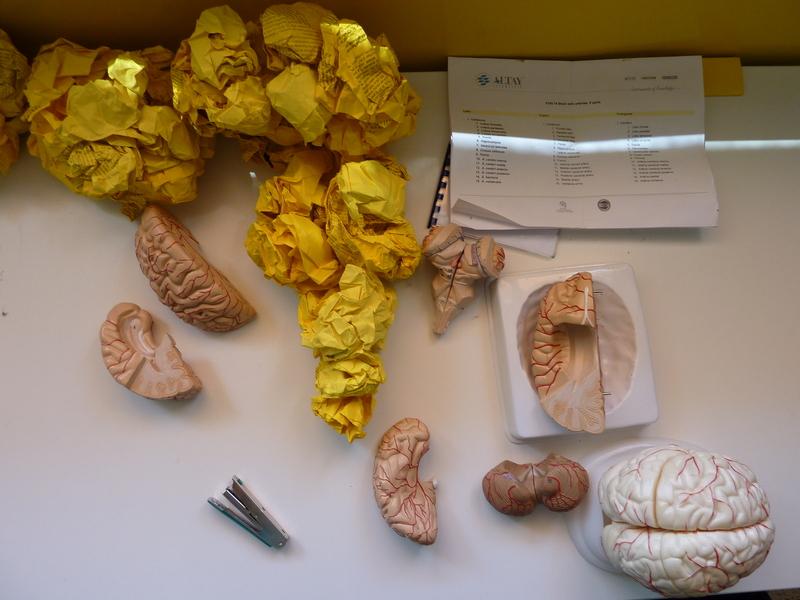 Then, we bound the different brain parts to form the whole brain. 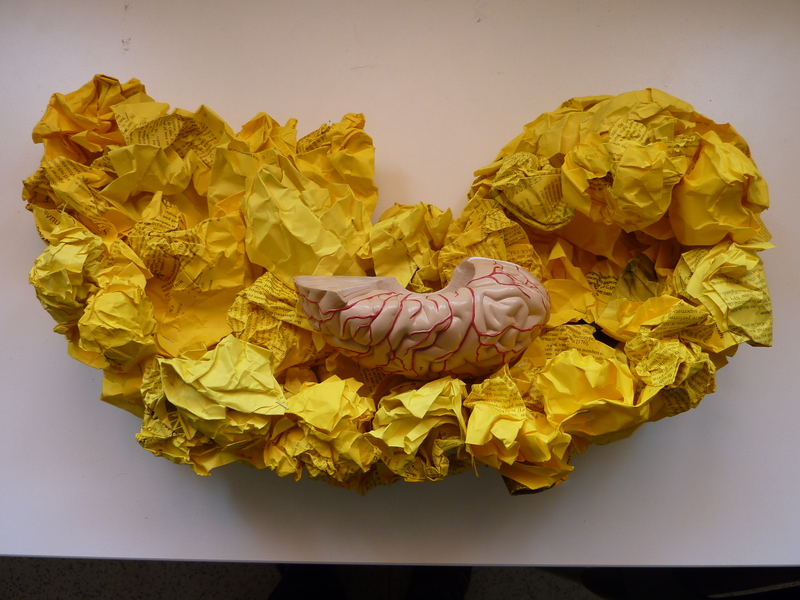 This is, off course, a special brain – it’s a brain built on scientific papers from CNC research groups, who spend their days trying to understand how the human brain works. In a way, they are trying to build the human brain through the knowledge they get from very specific experiments. Just like we did. This brain captures a part of our experience and experiments here at CNC, it’s built with it. One interesting thing we decided to do was give this brain the same weight of a real human brain (in average, of course). Our brain weights approx. 1.4Kg. – Agasse F, Bernardino L, Kristiansen H, Christiansen SH, Ferreira R, Silva B, Grade S, Woldbye DPD, Malva JO (2008). Neuropeptide Y Promotes Neurogenesis in Murine Subventricular Zone. Stem Cells 26:1636-1645. – Álvaro AR, Martins J, Costa AC, Fernandes E, Carvalho F, Ambrósio AF and Cavadas C. Neuropeptide Y Protects Retinal Neural Cells Against Cell Death Induced by Ecstasy (2008). Neuroscience 152:97-105. – Álvaro AR, Rosmaninho-Salgado J, Ambrósio AF, Cavadas C (2009). Neuropeptide Y Inhibits [Ca2+]i Changes in Rat Retinal Neurons through NPY Y1, Y4 and Y5 Receptors. J Neurochemistry 109:1508-1515. – Arduíno DM, Esteves AR, Oliveira CR, Cardoso SM (2010). Mitochondrial Metabolism Modulation: A New Therapeutic Approach for Parkinson’s Disease. CNS & Neurological Disorders – Drug Targets 9(1):1-15. – Bernardino L, Agasse F, Silva B, Ferreira R, Grade S, Malva JO (2008).Tumor Necrosis Factor-a Modulates Survival, Proliferation, and Neuronal Differentiation in Neonatal Subventricular Zone Cell Cultures. Stem Cells 26:2361-2371. – Bernardino L, Xapelli S, Silva AP, Jakobsen B, Poulsen FR, Oliveira CR, Vezzani A, Malva JO, Zimmer J (2005). Modulator Effects of Interleukin-1b and Tumor Necrosis Factor-a on AMPA-Induced Excitotoxicity in Mouse Organotypic Hippocampal Slice Cultures. J Neuroscience 25(29):6734-6744. – Cavadas C, Céfai D, Rosmaninho-Salgado J, Vieira-Coelho MA, Moura E, Busso N, Pedrazzini T, Grand D, Rotman S, Waeber B, Aubert J-F, Grouzmann E (2006). Deletion of the Neuropeptide Y (NPY) Y1 Receptor Gene Reveals a Regulatory Role of NPY on Catecholamine Synthesis and Secretion. PNAS 27:10497-10502. – Esteves AR, Arduíno DM, Swerdlow RH, Oliveira CR, Cardoso SM (2009). Antioxidants & Redox Signaling 11(3):1-10. – Esteves AR, Arduíno DM, Swerdlow RH, Oliveira CR, Cardoso SM (2010). Microtubule Depolymerization Potentiates Alpha-synuclein Oligomerization. Frontiers in Aging Neuroscience 1(5):1-6. – Pinheiro PS, Perrais D, Coussen F, Barhanin J, Bettler B, Mann JR, Malva JO, Heinemann SF, Mulle C (2007). GluR7 is an Essential Subunit of Presynaptic Kainate Autoreceptors at Hippocampal Mossy Fiber Synapses. PNAS 29:12181-12186. – Silva AP, Cavadas C, Grouzmann E (2002). Neuropeptide Y and its Receptors as Potential Therapeutic Drug Targets. Clin Ch Acta 326:3-25. – Silva AP, Lourenço J, Xapelli S, Ferreira R, Kristiansen H, Woldbye DPD, Oliveira CR, Malva JO (2007). Protein Kinase C Activity Blocks Neuropeptide Y-mediated Inhibition of Glutamate Release and Contributes to Excitability of the Hippocampus in Status Epilepticus. FASEB J 21:671-681.